On Saturday afternoon at the War Memorial Gym, UBC beat the University of Northern British Columbia (UNBC) Timberwolves in a 76-55 win in the Canada West play-in series. The Thunderbirds beat the Timberwolves 74-61 the night before on Friday. They ended the Timberwolves’ season the next day, securing a spot in the Canada West quarter-finals. The T-Birds were high on confidence in Saturday’s victory. They will be a force to be reckoned with as they advance deeper into the playoffs. The ’Birds scored the first points of the game, and had no intention of stopping from there. Fifth-year forward Kara Spotton was on fire for much of the first quarter as she scored a couple of back-to-back baskets. On the other hand, the Timberwolves did not have the best of starts, and it seemed like UBC wanted to close out the series and get the win more than UNBC wanted to keep their season alive. At the end of the first quarter, the score was 23-13 with UBC in the lead. The second quarter was a much different story. The ’Wolves got their sense of urgency back and it showed with their extra sharp effort on defence. They opened up the scoring in this quarter. But then the ’Wolves went quiet for almost four minutes afterwards, while the ’Birds extended their lead. UNBC scored back-to-back baskets to cut UBC’s lead back to 10 points. Both teams hustled and fought hard for every loose ball. They both knew what was on the line and neither team was going to let the other get the win easily. UBC kept on scoring, but once more, UNBC narrowed their lead down to 10 points. The ’Birds were also focusing especially hard on defence. They managed to get quite a few good steals — another reason why the Timberwolves couldn’t reduce UBC’s lead further. At the end of the first half, the score was 39-29 in favour of UBC. The ’Birds once again got on the scoreboard first in the third quarter. The ’Wolves scored in quick succession to reduce UBC’s lead to seven points with four minutes remaining in the quarter. Just when things were going in UNBC’s favor, the home team hit a three-pointer. UBC then went on a scoring run and managed to get their lead back to 10 points again. UNBC hadn’t scored a single basket in about four and a half minutes. Second-year guard Maddison Penn was terrific in this quarter, as well as the fourth. She knocked down some fantastic turnaround baskets while being surrounded by many defenders. Penn also made some fabulous passes. The T-Birds dominated this quarter and ended up with 56 points. while UNBC was at 41. UNBC’s bench continued to be supportive, as they never stopped cheering their team. UBC could have taken things slow with their large lead of 15-point, but they did the opposite as they continued to dominate. It was clear, especially in this quarter, that it was UBC who wanted the win the most. Rookie guard Ali Norris knocked down two back-to-back three pointers which sealed the victory for the ’Birds. The Thunderbirds were an impressive 50 per cent from the field, while the Timberwolves shot only 31.6 per cent. The T-Birds were much better than the Timberwolves from the three-point line as well. 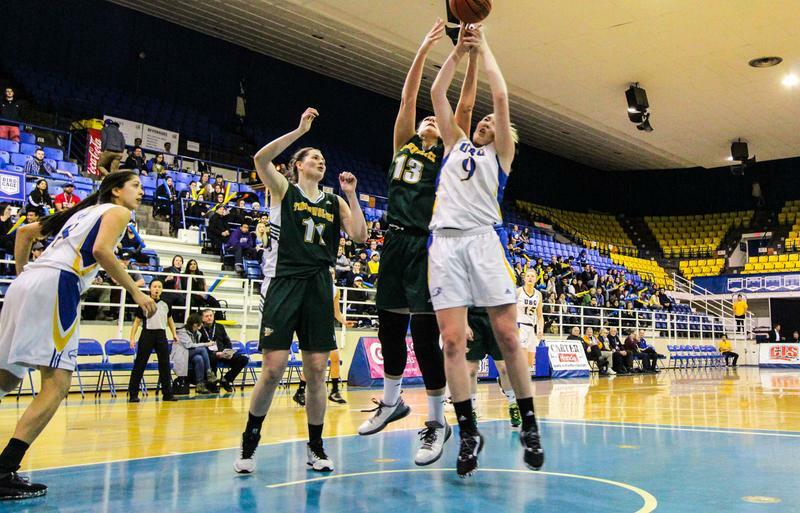 UBC converted 42.9 per cent of their three-pointers, while UNBC made only 18.2 per cent. The ’Wolves were better than the ’Birds from the free-throw line. Additionally, UNBC had more second-chance points compared to the home team. Still, UBC had more points in the paint, points off of turnovers, fast break points and bench points than UNBC. It was a dominant victory for the Thunderbirds, as they demonstrated they were ready for the games to come.